La maison Afffair a présenté sa nouvelle collection printemps-été 2019 lors de la Fashion Week prêt-à-porter à New York. Afffair Spring - Summer 2019 Collection in Elle. Ismayil’s “Power of Fire” was a fun escape to luxury and decadence. Rufat İsmayil 2019 İlkbahar-Yaz Koleksiyonunu muhteşem bir defileyle tanıttı. Afffair Spring - Summer 2019 Collection in Woman Spain. Afffair Spring - Summer 2016 Collection in Alpha Fashion Magazine. Istanbul based men’s wear brand Afffair participated in the Mercedes-Benz Fashion Week Istanbul. The collections created by Ali Behnam Bakhtiar and Rufat Ismayilov, are a crossover between luxurious sportswear and high fashion. Turkey launched a new brand at Pitti Uomo exhibition and held a guerrilla presentation as part of the “Alternative Set”. Turkish ready-to-wear men’s fashion brand Afffair has been one of the opening brands at Milan Fashion Week. Turkish Fashion Brand Afffair’s menswear collection for AW 15/16 was highly anticipated by fashion lovers in the region. Afffair is a Turkish brand founded by Rufat Ismayilov, a talented designer with a global vision and touch, and Ali Behnam Bakhtiar, who began his career creating projects for Haute Couture brands in Paris. The brand is located in the heart of Istanbul - hosting the synthesis of East and West. Mercedes-Benz Fashion has been opened with a wonderful fashion show by Afffair. Being the first Turkish brand participating at Milan Men’s Wear Fashion Week, we asked designer and former Azerbaijani model Rufat Ismayilov to tell us the story behind his succes. Mercedes-Benz Fashion Week Istanbul’s opening show was the Afffair AW 2015 Collection. The brand is known for their mix of luxury and sports wear created especially for the modern and stylish man. Afffair is a brand founded in Istanbul by two designers: Rufat Ismayilov and Ali Behnam Bakhtiar. 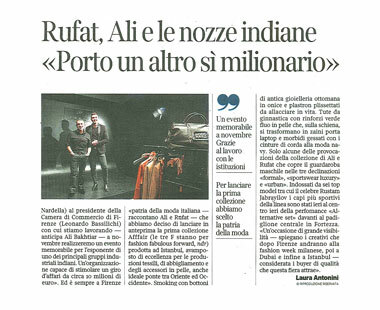 Turkish Fashion Brand Afffair in Florence. Italian Newspaper Corriere Fiorentino published an item about Afffair. The Fashion Illustrated site published an article about the Afffair Launch Party.